KING Kamehameha I might have sway over the islands, but at least one mainland organization has nixed him from Hawaii's commemorative quarter. Last month, the U.S. Commission of Fine Arts rejected, for their weak composition, all five designs sent by the Hawaii Commemorative Quarter Advisory Commission. Three of the drawings included King Kamehameha I. But not all is lost for Kamehameha. Another organization that reviews states' proposed quarter designs, the Citizens Coinage Advisory Committee, has recommended keeping the king on the coin. Instead of Kamehameha, the Fine Arts Commission wants Diamond Head as the piece de resistance on the coin, according to commission Secretary Thomas Luebke. One commission member said Diamond Head is a landscape that people can visually understand, Luebke said, adding that others found the designs were too cluttered and "visually confusing." The commission tends to favor designs that are more simple, Luebke said. Several commission members could not be reached or declined comment yesterday. But according to a recent article published in Coin World, a weekly publication for coin collectors, members of the Citizens Coinage Advisory Committee favored the design of the King Kamehameha statue with Diamond Head in the background and the word "Aloha." Committee members liked the state's motto and the idea of having another language on the coin, but settled on the coin with the word "Aloha" because it is a Hawaiian word everyone is familiar with, according to the article. Both the committee and the Fine Arts Commission were to make their recommendations to the secretary of the Treasury. The groups also recommended designs for Oklahoma, Alaska, New Mexico and Arizona. The Hawaii quarter commission proposed five designs: a surfer with Diamond Head in the background; a hula dancer with the Hawaiian island chain; and three with the statue of King Kamehameha I and other island motifs. 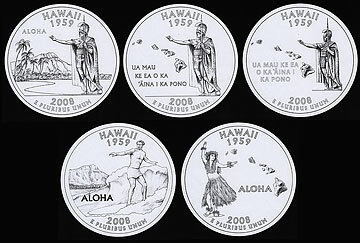 The Hawaii quarter would be the last to be minted through the 50 States Commemorative Coin Program. The designs are currently with the U.S. secretary of the Treasury for preliminary approval, and then will be sent back to the Hawaii commission so members may select the final design and make a recommendation to Gov. Linda Lingle. The governor is expected to select the final design by mid-April. Hawaii commission Chairman Jonathan Johnson said they have not received official statements from the committees and declined comment. In a meeting held in December, some Hawaii commission members said they want the Hawaii quarter to include King Kamehameha.